OSWEGO, NY – On Monday morning (October 29), the residents of Morningstar Residential Care Center and Pontiac Care & Rehabilitation Center received a warm surprise from Compass FCU’s Assistant Manager Denise Grinnell, and Member Service Representative, Chelsea Legates. 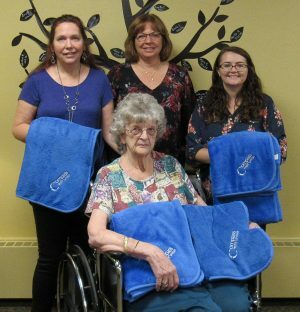 With the weather cooling quickly, Compass donated more than 60 soft, blue blankets with the hopes of a cozy holiday season for the local care facilities’ residents. “It’s so soft” said Morningstar resident Agnes Rowlee, as she stroked her new gift.